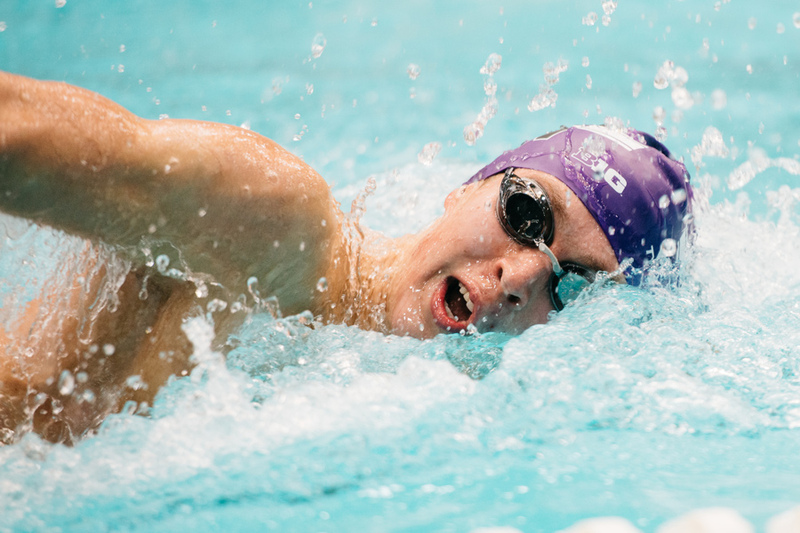 A Northwestern athlete swims freestyle. The Wildcats are heading to Iowa City for a Big Ten tri-dual meet. After a break of just over two months, Northwestern will hit the pool again on Saturday, opening the winter portion of its season with a trip to Iowa City to face a pair of Big Ten foes. The Wildcats will be up against Wisconsin as well as the host, the Hawkeyes. NU will be in for a tough battle against the Badgers, whose men are ranked No. 24 nationally and whose women are ranked No. 14. First-year coach Jeremy Kipp said the Cats and Wisconsin are strong in similar events on the women’s side. To stay in shape during the long layoff, NU traveled to San Diego during Winter Break for a training trip. Kipp said he considered the trip a success — the team accomplished its goals in San Diego and got in some fast swimming. The Cats also cheered on the NU football team in San Diego, going to the Holiday Bowl to watch Pat Fitzgerald’s team defeat Utah. Both NU programs are coming off wins at the TYR Invitational in November. The men had strong performances from freshmen Ryan Gridley and Henry Blaul and sophomore DJ Hwang, who all had first-place finishes. The women were led by freshman Tara Vovk, sophomore Rachel Tseng, sophomore Melissa Melnick and junior Malorie Han, all of whom touched in first in at least one individual event. Perhaps brightest among the stars at the TYR Invitational was sophomore Calypso Sheridan, who set a school and pool record in winning the 200-yard backstroke. The Brisbane, Australia native also took first place in the 100-yard individual medley. Sheridan said she has specific goals for the Cats in their meet this weekend. The NU men beat both the Hawkeyes and Badgers in the 2013-14 season, but have not won a Big Ten dual meet since against any opponent. The women have had their share of success against Iowa of late, but Wisconsin has been a thorn in their side in recent years. Senior Tyler Lis, however, is confident the Cats can change the narrative this weekend and said combining the men’s and women’s programs this season has brought much-needed change to the team culture.